I'm partnering up with Minnetonka to offer you a chance to win your own pair of Front Lace Knee Hi Boots! For a chance to win, please leave a comment here describing how you would style these boots! You may gain additional entries by following Minnetonka on Twitter, or liking Minnetonka on Facebook. This giveaway is open to US residents only. The winner will be drawn on February 5th and announced shortly after. When leaving a comment, please make sure your email address is linked in your profile so you may be contacted. Good luck, friends! I love those boots!! They look great styled with a dress like you had in the previous post. I think they would also look great with a pair of skinny jeans and a light, flowy top. With everything! I have a pair of the moccasin flats and I wear them all the time! Great shoes. Eek! I love em! Would style with some cute leggings and a gypsy poncho. I'd wear these with the cutest green dress I just bought. They look comfy :0 ! Oh these are fantastic! I love my Minnetonka moccasins and would be thrilled to add these to my closet. I'd style them with a flowy top and leggings, I think! I love these! I want a pair! I'd def pull it off with some awesome Leggings and a flannel or even chambray top and with whats going on outside my home def a cute sweater over top. :D COZY and CUTE. I would wear them with dresses and sweaters, or skinnies and button-down tops. So many options!! I also liked 'em on fb! oh my dear. I might never take them off! LOVE these! i have the perfect tea colored crochet maxi dress to wear them with! Oh, I love these. I need a pair of tall brown boots - I'd pair them with leggings, a flowly dress and an oversized seater. I liked their fan page on facebook! Ooh I'd wear them with a cute dress! I'd style them with my favorite tights and black white dress! coral skinnies and a denim top! I would style these boots with a white and navy striped button-up dress I have layered with a sweater over the top and wine colored tights! I've followed them on twitter! I've liked their facebook page! Love these! Love the outfit you are wearing with them! I would probably wear them with skinny jeans, funky tshirt, plaid coat and my crochet slouchy hat! So excited. Liked them on Facebook as well. Loooove! I just bought several pairs of sparkly tights in colors like cream and mint, so I'd pair those with the boots and top it off with some stretchy pencil skirts and a light-colored flowing top. Too cute. Oops, I forgot to mention my email is mediokra@me.com. These profiles don't seem to like me! I would pair them with shorts - my movember t-shirt and oversize bf sweater for the perfect winter festival look! I love those boots and have added them to my online shopping cart so many times but never had the money to buy them! I have always dreamt of styling them with tights and my denim dresses or paisley and eyelet textured dresses with a cardigan in the fall or with cut-off shorts and a t-shirt in the spring. I like Minnetonka on Facebook! I would wear them with a Mexican dress or skinny jeans and a cardigan. They are great. Boots of my dreams! I would go tights, floral scallop high waisted shorts and Breton striped tee and my dark brown tram conductor's bag slung across my shoulder! these would complete my mommy uniform: a pair of black tights (sometimes with a little skirt worn over them), a grey v-neck boyfriend tee, a chunky knit cardigan and mismatched jewelry. i followed them on facebook and twitter - would love to win this awesome giveaway. i think the winning gods are against me - so i will cross fingers, toes and eyes for this chance! Oh my gosh those boots are stinking cute! Right now, I'd wear them with skinny jeans & a sweater or plaid shirt. Once the weather warms up, I'd wear them with a cute skirt or dress. I would wear these with skinny jeans and a big sweater... probably every day of my life. They look so comfy! I am in love with these boots! I would wear these with my many dress, long ones, short ones, flowy ones - there is no wrong! I would probably style them with leggings and a long tank or longer tank with a slip dress. They are totally adorable and probably the most comfortable! I would wear style these with fun colored skinny jeans and a comfy sweater! I love these boots as well as all of the different styles Minnetonka offers! I would style these with a red dress, nice thick nights, and some cute hair accessories... and, of course, loads of snow! I have some of the moccasins and they are great. I bet these boots are fabulous. I would love a pair. Love Minnetonka! I would wear them with everything, I'm sure but the first thing that comes to mind is a vintage knit poncho with leggings. I would wear a pretty floral sundress and throw my hair up in a messy bun for an easy cute style for everyday wear! Growing up, Iwould just wear these with jeans, but oh.....the possibilities you younger girls show us now, you could wear these with pretty much anything!! Either jeans and a comfy sweater, or my vintage red and yellow dress! Ohhhh, I would definitely be wearing these with some skinny jeans and my favorite poncho. Minnetonka boots are the best I have loved every pair I have ever had! I have had several pairs over the years and they go with everything...vintage dresses, jeans with t-shirts, skirts, shorts and everything between! I would love to try out a pair of Front Lace Knee Hi Boots which are different than any other Minnetonka boots I have rocked. I would style these with dresses+tights and cardigans for the rest of winter and spring. I love the different look the lace-up boots give! I would definitely style these with a short-length bohemian style dress, head-band and lots of bangle bracelets! I would style these with my grey, fitted jersey dress, black tights and finish off with my huge vintage jeweled owl necklace. There are some great outfit thoughts here! I was concerned that these might give off too much of a "pioneer/mountain" vibe, but I've got some new oxblood leggings that I think would really pop underneath these boots! Can I suggest that the winner gets a guest post to show off how they styled their new boots? I would wear these with my black leggings and a cute flowy miniskirt/sweater combo - they are to die for! I would style these with a just-above-the-knee skirt and a tank, with a cardigan. Topped off with a lovely glass bead necklace. These boots are beautiful. These boots with cranberry colored tights, a white long sleeved short skirted lace dress, a large 70s inspired gold pendant and a pink flower crown! I would wear these boots with skinny jeans and a peacoat--just the thing to bundle up on chilly days! I also like Minnetonka on Facebook. I would definitely wear these boots with leggings and a big cozy sweater! I love Minnetonka Moccs! ...And I liked on Facebook! I've been eyeing these boots for a while now. I would wear them with a tan dear-printed corduroy dress that falls just above my knees with a cardigan. Oh I would love to wear these with my mint baby doll dress and no tights (a dream!). I love these boots! I would wear them with one of my favorite dresses: a brown and cream zebra-print wrap dress. And large dangly earrings. Oh Love!!! Leggings and a big fun sweater!! I´ve followed them on fb! I also follow Minnektonka on Facebook! I also follow Minnetonka on Twitter (@cheerfuld)! I would wear them with skinny jeans or tights. Lets just put it this way, my first pair of moccs I wore until there was a great ig gnarly hole in the sole. I would pretty much wear those with EVERYTHING. Also, added on FB! oohh! i want to win! what could i not style these with? i am mostly a skinny jeans and leggings kind of gal, but i would also pair them with tights and a dress. what an awesome giveaway! personally, i would style these with thick leggings and a shirt dress, a cozy scarf and a pair of feather earrings. i also liked minnetonka on facebook. I would wear these with skinny jeans and a big sweater. Probably a long necklace too! I love my Minnetonka booties, and I wear them with everything! I'd love to have the boots ... I'd probably wear them with tights and a shirt dress or tunic. Following on twitter + facebook, too! I have a maxi skirt & crop top just BEGGING to be worn with these! Thanks for the opportunity! If I could please oh please oh please win these, I would give them to my very best friend who would, no doubt, wear them with all manner of tights and skater dresses on work days or tights and bulky sweaters on off days and would probably wear them into her bed as she falls asleep completely in love with her newly acquired footwear. I should at least get the run-on-sentence award. These boots are so cute!!! I'd definitely pair them with a cute pair of tights and a new spring dress. Squeal, love these, and love Minnetonka! I would style these with some funky leggings and an over-sized sweater. i'd style these boots with skinny printed denim, a chunky sweater, and probably a warm hat. For a more dressed up look I would pair them with colored tights and the new ribbons and rows free people dress I bought. For more casual days I think they would look great with just plain skinny jeans and a nice comfy sweater! Oh, lovely giveaway! I would style these with some navy-blue tights and a block-printed cotton dress and a brown cardigan. So cute! I live in Texas and it's in the 70's 'round these parts. So I'd wear these classic boots with a simple sun dress while donning bare legs and a worn in denim jacket if weather permits. I would style those babies with some black tights/leggings, a black dress, a tan belt and a colorful cardigan. I'd style them with tights and pretty much any skirt I own! I've been crushing on these babies for a while! I'd style the boots with dresses, tunics, skinny jeans and longer tops/tunics... love Minnetonka! Fingers are crossed!!! Thanks for the chance! I would totally wear them with skinny jeans and a high low cowl neck sweater! Love them! I would wear them with a romantic white dress or a peasant top! I would definitely style this with tights and an autumn dress. Plus a scarf. They are perfect! Oh my gersh I've been pining over these babies! How would I wear them? with skinnies, skirts, tights, and shorts! I would wear them with a skirt and a cardigan! I would pair these boots with a girly lace flowy dress. These boots are amazing! I also liked them on Twitter!!! I would wear these with a vintage chambray shirt and bolo tie. Please please pick me! love them!!!! I would pair them with skinny jeans and a soft white lacy shirt. jesicadawn@hotmail.com. I love Minnetonkas! They are so comfortable! I would wear them with leggings and a big knobby sweater. I live in Utah so it's freezing right now, I would love to be wearing these! I am obsessed! These are just too cute and can totally wear with dresses, shorts and pants! Love these. Ooh! I would wear them with my denim skirt and my bright colored poncho I bought at Xochimilco! I'd wear them with tights and a skirt! These are really cute boots! I would love to try to wear them with a nice fall dress! Also, I liked on Facebook! Fun! I would wear these boots with a floral sundress and a cardigan! I love these! There are endless possibilities with these boots... but the first outfit that comes to mind would be these beauties paired with olive green tights and a gray, knit dress. I've been entering every Minnetonka giveaway I can find (to no avail)! I followed them on Twitter and liked them on Facebook. So hoping I win! I would wear them with spring dresses and a cardigan to transition to a new season! I've always wanted a pair of Minnetonka boots, but never thought about how I would style them! I think they would look so cute with a black dress and colorful tights. So cute! i would wear these boots with cut off jean shorts and an oversized tee...or a mini dress....or skinny jeans. they're awesome! I would style these with black tights and striped blue tunic with my fav. mustard cardigan or I would wear them with my cable knit beige knee high socks and my grey cotton dress. Those boots are so gorgeous! I'd wear them every which way-- over tight jeans or leggings, with a mini-skirt or under my favorite long prairie skirt. I wouldn't have thought to style them the way you did but now I'm inspired. I could wear these with every bright dress in my closet! I would definitely wear these with skirts and bright tights! So fun! I would keep my outfit pretty simple, skiny jeans and warm cozy sweater with these boots would be lovely ! Thanks for the giveaway! I think I'd probably style these boots with tights and a flowy dress. Since the weather is chilly I'd probably throw on a scarf and my jean jacket too. I would style this with some nice leggings and a long shirt with belt. Just something super comfy! Love these! I would style them with a pencil skirt and sheer blouse! Right now, I would pair them with some opaque tights and a sweater dress or a pair of skinny jeans an a fun top. I think you can easily extend them into spring by losing the tights and pairing with a denim mini and a paid top. I'm not a fan of the fur-lined Ugg boots and mini skirt look - but I don't think these would wear that way. Also, I don't have a twitter account but I liked them on facebook. I would wear them with black leggings and I have a beautiful maroon dress that would go perfect with it! Please count me in ! ooooooh! 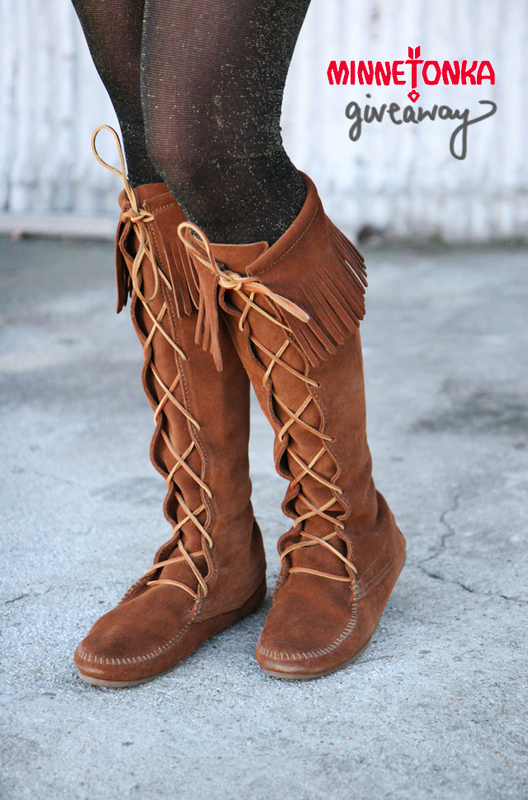 planning our wedding in october and i am dead set on wearing a pair of these :) cowboys and indians theme. these shoes are **perfect**! I follow Minnetonka on Twitter!!! Oh, I love them. As my husband points out, I'd probably wear them with EVERYTHING, but I'd say tights and an above-the-knee dress would be adorable! I have a great, funky dress from modcloth that would look amazing with these boots! Thanks for the giveaway! I would put them with a pretty knee length dress! Such a great giveaway! Crazy about these boots! I'd wear them with dresses galore! Love them! I have a chevron dress that would look perfect with these boots!